Where to put a search filter checkbox left or right side? 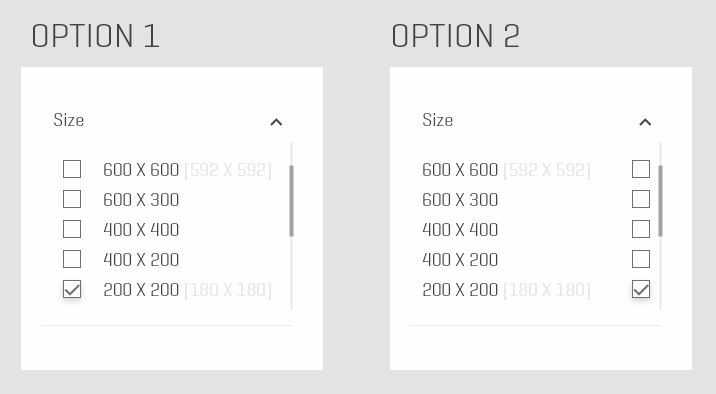 I have a search filters design for an eCommerce website, I wonder where should I put the checkbox of each filter? Any suggestion in terms of the usability and user experience? While there's no hard and fast rule for matters like this, option 1 has the advantage of keeping the checkbox closer to the item it relates to, preventing the user from needing to mentally process which checkbox belongs to which item. In fact, I'd reduce the gap between the checkboxes and their labels quite significantly if I were you. It also helps conceptually to handle scenarios where an item may wrap due to very long content, since on the left (in LTR languages) the checkbox can align directly with the start of each item in the list (like a bullet in an unordered list); if you imagine a label wrapping in option 2, it's not clear to me how I'd expect the checkbox to be aligned vertically. Not the answer you're looking for? Browse other questions tagged usability website-design e-commerce or ask your own question. eCommerce search with Images and prices as you type - is it too much to put in the search result? Is there any reason Google does not provide any filter beyond bare search bar? Whats should be slideable right panel name which consist of two tabs Search and filter options?